This is a really good use-case for cancelling fetch requests: making API calls while autocompleting in search. It's very convenient to be able to quickly share a link to a code snippet, which is something I've mostly done using gist.github.com. While often the code snippets are sort of throwaway, I still feel bad that I'm posting them in a place that I don't control. Today I added support to my site for natively posting code snippets. It wasn't nearly as hard as I was imagining it was going to be! Since my site doesn't have a posting interface of its own, that also meant that I needed to add support to Quill to create these posts via Micropub. Since this is still relatively experimental, I didn't add a button to it in Quill, but the page is live. The only required part of this is the code box. The interface lets you optionally set a filename, which will automatically set the language if it matches a list of known languages. The language is included in order to indicate to my site which syntax highlighter to use. Here's what that ends up looking like on my site. I use the GeSHi syntax highlighter, which covers a wide range of languages and works very well, but I'm not super happy with the colors it uses. 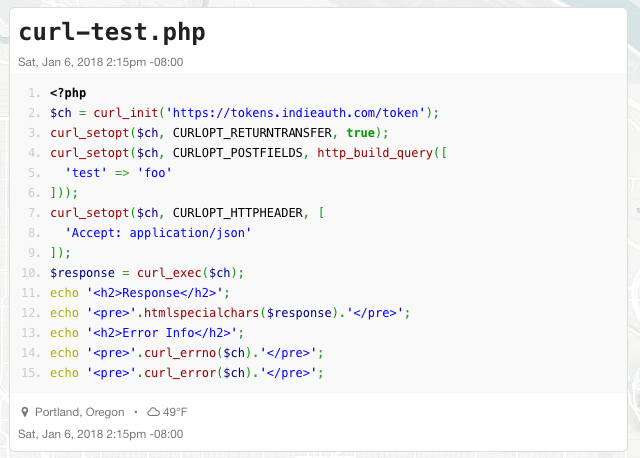 I'd like to find a stylesheet or even a different syntax highlighter that looks closer to the colors on GitHub. In the mean time, I'm happy enough with this to use it. I ended up doing quite a bit of fiddling with my CSS to make these posts look good. You'll notice the grey background of the code block extends to the edges of the post, whereas normally there would be some padding. I also changed the font of the post name to a fixed-width font. If there is no filename, then I wanted the grey background to extend to the top of the frame, which is also something unique to these posts. The last step of making this actually useful is to integrate this into my browser workflow, including editing the posts easily. There is a bookmarklet that will either open up a new window or launch the editing interface depending on whether I'm looking at an existing code post. I'm pretty happy with this, and I hope I don't post on GitHub anymore unless I'm specifically using their fork feature of Gists! Finally packaged up my HTTP functions into a library! https://github.com/aaronpk/p3k-http Previously I had been copy+pasting these around to quite a few projects. Happy to have consolidated these finally! Cosmos Browser allows a person to connect to the internet through the use of SMS. No data or wifi required. UPDATE 2/13/09: There is a newer version of the IMAP Authentication plugin for Wordpress 2.7.1. It seems like IMAP authentication would be a pretty basic plugin to find for Wordpress. A google search doesn't turn up much. I found this one which was apparently written for an older version of Wordpress. 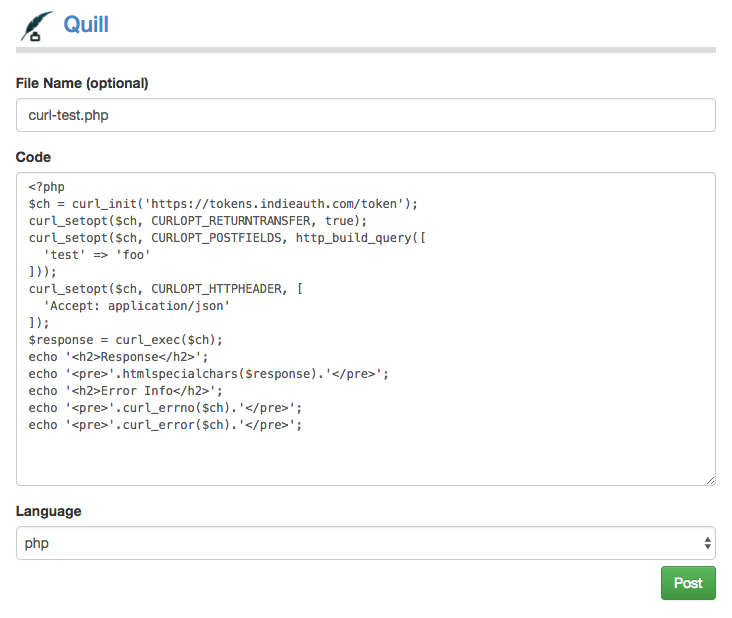 Never having written a Wordpress plugin before, naturally I decided to fix it to work with version 2.6. Below is the result of my efforts. I started with Norman's code, and modified it until it worked with version 2.6. I apologize if it is written poorly or if I missed something terribly obvious; I've never written a Wordpress plugin before. Description: Authenticate users using IMAP authentication. the user in Wordpress if they don't already exist. * Add an options pane for this plugin. * Return the mailbox option from the database, creating the option if it doesn't exist. * Add the mailbox option to the database. * Return the user_suffix option from the database, creating the option if it doesn't exist. * Add the user_suffix option to the database. // the user checked out on the IMAP server, but there was no record in the database. Automatically add it now. * fields on profile screen. Sorting a query in MySQL ignoring the word "The"
When you have a database of books or movies, some of the titles begin with "The." If you do a regular ORDER BY on the table, all the titles that start with "the" get clumped together. One option is running an unsorted query and sorting in PHP, but it would be better to sort at the database level. Here is a query I came up with to do that, using an IF function in MySQL! Now create a custom function for that, and it's even easier to use!